Aluclad exterior doors are a showcase of a house and its owners. Their timeless beauty is a result of proven technologies and professional skills of our employees. Each door is manufactured to individual order.Customers can choose their own model out of about 40 factory patterns or suggest their own design. As with all manufactured goods, we offer a wide range of ornamental glass, door handles, locks and aluminum thresholds. Exterior doors stand for great design, strong construction and very good parameters. Our doors are a long-term investment. Casing Construction: Single-casing, door casing and door leaf cross-section: 68 x 81 mm. Door Leaf Construction: Leaf cross-section: 68×120 mm (Classic, Modern). With Stadur infill panel.The leaf has one- or two-sided nosed skirtings. The leaf is made of a smooth panel Variotec (only meranti) in Deco models. If technically possible, we can provide any shape and size of the door. Material: Three-layer glued scantling, homogeneous or combined in length. Wood types: pine, mahogany, meranti, oak. Sound Insulation: Sound reduction index for a standard unit: Rw = 31 dB. Glazing: Double-glazing, single-chamber (4-18Ar-4), 26 mm unit, the heat transfer coefficient Ug = 1.0 W/m2C (BS EN-674), inter-pane cavity filled with argon. Ornamental glass, safe, with sun protection properties – option. Aluminum spacer – standard. Warm edge spacer – option. Window Muntins: Vienna (glued wooden + internal aluminum,widths: 22, 32, 42mm), inter-pane, construction Widths: 60mm or 80mm. Fittings: Vienna (glued wooden + internal aluminum widths: 22, 32, 42mm), inter-pane, constructionwidths: 60mm or 80mm. Handles: White, silver or olive galvanized die cast by FKS 35A/2200. Thresholds: New Wesser, Old Wesser, Dafa, Guttmann. Colour: Transparent paints according to Sigma Coatings colour charts. Opaque paints according to RAL and NCS colour charts. 4 coating system, impregnation, primer, interlayer, topcoat. Gaskets: Undercut, press-in, with TPE closed profile by Deventer or Primo. Gasket colors matched to the color of woodwork. Softline – 2 rebate gasket – option. light brown, dark brown, black. Accessories: Visor, retractable threshold seal, anti-burglary bolts,Geze closer, WALA handles, inserts with a scoop. DK Window manufactures both outward and inward opening traditional entrance doors, patio and balcony doors. Doors are made of solid wood profiles. Double glazing or insulated panels are used as infills. Thermal transmittance Uw = 1.4 W/m2K. It is possible to manufacture single or double leaf doors. Finishing according RAL, NCS (paint) or (lacquer) tone catalogue by customer’s choice preference. Available as aluminium clad door too. Closing system by Swedish lock manufacturer ASSA: hinges and three-point locking espagnolette. Patio and balcony doors have more simple locking system. For higher energy efficiency DK Windows offer 3K door solution. Triple glazing or 40 mm insulated panels are used as infills. Thermal transmittance Uw = 1.0 W/m2K. Energy efficient entrance door can be either outward or inward opening entrance door or patio or balcony door. Doors are made of solid wood profiles. It is possible to manufacture single or double leaf doors. Finishing according RAL, NCS (paint) or (lacquer) tone catalog by customer’s choice preference. Available as aluminium clad door too. DK Window’s energy efficient and modern panel door is manufactured of integral insulated door leaf. Rigid XPS plate is used as insulation and triple glazing as infill. Thin aluminium layer serves moisture protection purposes. Thermal trnasmittance Uw = 1.0 W/m2K. A panel door can be either outward or inward opening entrance door or patio or balcony door. 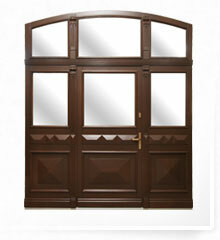 Doors frame is made of solid wood profiles. It is possible to manufacture single or double leaf doors. Finishing according RAL, NCS (paint) or (lacquer) tone catalog by customer’s choice preference.